To get around this limitation on their research, psychologists will identify the target population (everyone they'd like to test) then recruit a sample that they think is representative of that population. If the sample really is representative, the results of the sample could be generalised to the target population. If the sample isn't representative, then the results will not be generalisable and will only tell you about the sample itself. Target populations have to be realistic. "Everyone in the world" is NOT a realistic target population. A target population is usually "everyone in my Sixth Form" or "everyone in my workplace". Professional researchers might be able to sample "everyone in the country" but this is uncommon. Ariel Rubenstein (1982) points out that too much cognitive research is carried out on college students. He compares them to fruit flies, which are used in genetic research because they are small and convenient and have very short life spans (so you can quickly see the effect of a genetic change on a fly's descendants); in contrast, there's not much genetic research into elephants. Rubenstein points out that much cognitive psychology boils down to the "science of the behavior of the college sophomore" - someone who is white, middle-class, educated and 18- to 20- years old. The sample is those members of the target population who happen to be available at the time. Opportunity sampling involves getting hold of the nearest and most convenient people: your friends, neighbours and passers-by. It’s easy to use, but there’s a big risk of experimenter bias, because only people near to you or known to you have any chance of being in the study. "Random" is often used as a slang word to mean "unplanned" or "without thought". An opportunity sample is what you probably think of as a "random sample" because it doesn't take much preparation and you might select people on impulse. The sample is those members of the target population who select themselves. Volunteer sampling involves asking for volunteers – for example, advertising your study on a notice board or on Facebook and using anyone who signs up. Because they have volunteered, this sort of sample might be more committed than a sample that has to be approached and asked. That might be important if the research involves tasks that are stressful or boring. This produces a much more varied sample than opportunity sampling because there's no experimenter bias. However, the sample may still be unrepresentative because you only get certain sorts of people volunteering (the ones interested in Psychology, people with a lot of free time). You could think of this as participant bias instead of experimenter bias. What's more, people have to see and understand the advert to have a chance of being in the sample, so that might rule out participants who speak other languages, don't read newspapers or who aren't online. It also takes longer (because you have to wait for the volunteers to show up). Psychologists aren't consistent in the terms they use. Edexcel call this technique volunteer sampling but you will see other books and websites calling it "self-selecting sampling". The sample is members of the target population selected without any bias. This sounds like an ideal method, because you use an unbiased way of identifying people in the target population, for example by pulling their names out of a hat. 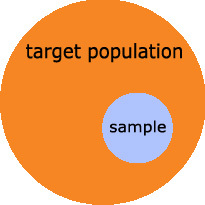 However, it’s often very difficult to get a complete list of everyone in the target population, so this sampling technique is normally only used when the target population is very small; for example randomly selecting people from out of your class. Also, just because the sample was selected in an unbiased way, it doesn't mean it must be representative. You could selected people randomly and still find you had an unrepresentative sample that was all-boys. "Random" is often used as a slang word to mean "unplanned" or "without thought". A truly random sample isn't like that at all. It takes a lot of planning and thought. BEWARE. If you're tempted to say that a sampling technique is "random" because you're just picking anyone you see nearby without thinking about it, you really mean "opportunity sampling". The sample is members of the target population selected in an unbiased way but guaranteed to be representative in certain ways. Strata are sub-groups within the target population (like boys and girls or different age groups). This technique involves working out the strata you need in your sample and how many people there should be in each, then filling the strata through random sampling. This is much more representative than normal random sampling because you make sure that each sub-group gets represented. It’s probably the most representative and unbiased technique there is, but it’s very fiddly and only works if you have a complete list of everyone in the target population. An example of a stratified sample might be a school that makes sure there is a random group of 1st year students, a random group of 2nd year students, etc, making up a stratified sample of the entire student population. Researchers have to decide on important strata in advance and this can cause problems. It's not always obvious which strata are important (do you need to stratify tour sample by gender? by race? by IQ? by personality?). Some strata might be difficult to operationalise; for example, you might want to stratify your sample into people 's sexual orientation, to match the proportion of straight and gay people in the target popuation, but it may be hard to find this sort of information out. Opportunity sampling is best when your target population is gathered together in a location where you can approach a varied selection of them: students in a common room, teenagers at a youth club, employees in a work canteen. Volunteer sampling is best when your target population is likely to read the same magazine or newspaper, visit the same website or look at the same noticeboard. Random sampling is best when your target population isn't too large and you can get hold of a "master list" of all the members, like a student register or employee payroll. Stratified sampling is best when you have what you need for random sampling and also the topic you are researching suggests a small number of very obvious strata (such as studying levels of aggression, which should be stratified by gender, as opposed to memory recall, which shouldn't). 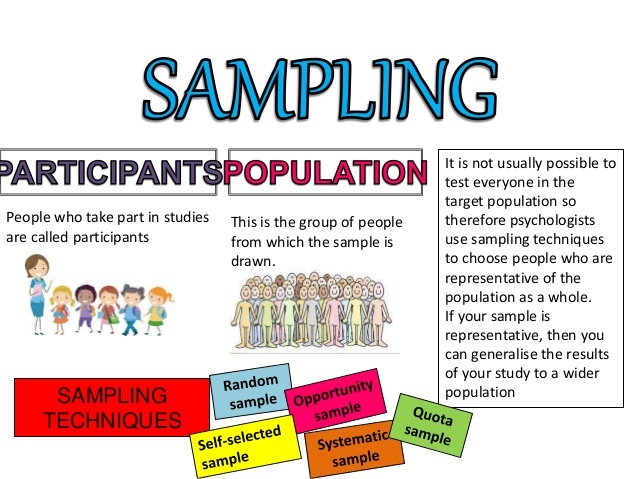 Cluster sampling isn't mentioned in the Edexcel Unit 1 Specification, but I'm adding it here because you may end up using it in your own practical investigations. Cluster sampling selects members of the target population who have already been gathered together for another purpose. 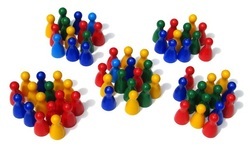 Clusters are groups of peope in pre-existing groups that belong to the target population. It might include classes or clubs within a school population, churches within a religious population or families within a neighbourhood population. The main advantage with a cluster sample is convenience: you can just go to the lesson or club meeting and test everyone there. A final advantage is that a cluster population can be used if it's impossible to discover all the details of the target population. For example, if your target population is "skateboarders", you might have difficulty getting a full list of all those people or reaching out to them for an opportunity or volunteer sample. But you could make a cluster sample out of the skateboarders who use your local park. The main disadvantage is unrepresentativeness. The cluster may be unrepresentative of the target population. Crucially, if you don't know the characteristics of the target population, it's difficult to tell how representative or unrepresentative it is. Cluster sampling is best when you don't know the characteristics of the target population or the other methods of sampling are inconvenient. Most psychologists are lecturers and professors at universities and they have an unfortunate tendency to use the student body as their target population and their own students as the sample. Rubenstein (1982) complains that psychologists over-use students in their studies, comparing them to the fruit flies studied by researchers into genetics. The problem with this is that "university students" is a pretty limited target population to begin with, but "Psychology students" may not even be representative of that. For example, Psychology is particularly popular with females. In 2011, 78% of students accepted onto UK Psychology degree courses were women. Back in the '60s and '70s, when Psychology was a rather obscure subject, Psychology students might have been more unusual than other students simply for having chosen it. Another problem is that Psychology students already know some Psychology. This increases the risk of demand characteristics; the students might figure out (or think they've figured out) the purpose of the research and start behaving unnaturally. A good example of opportunity sampling is found in the Sherif Robbers Cave study. Sherif sent his observers out to schools in Oklahoma, looking for boys who fit the profile of being white, athletic and confident. With the permission of school principals, the observers identified likely boys in the playground, checked their school record to make sure they were of good academic ability and had no behavioural problems, then contacted parents to invite them to take part. The target population was schoolboys aged 12 who were white, athletic, of above-average IQ, from two-parent Protestant families. Sherif focuses on "white" and "Protestant" to screen out immigrants who might be new to the area; he didn't want any pre-existing reasons for the boys to treat each other as outsiders. This opportunity sample was limited to boys who happened to attract the observer's attention (because they happened to be playing in the school playground that day) and also boys from the schools that Sherif happened to send observers to. However, Sherif told his observers to choose the boys themselves to prevent the risk of bias because school principals might "recommend favorite boys for the camp". Watson & Rayner's Little Albert study also uses an opportunity sample: Albert B. was chosen because his mother worked at the hospital to which Watson was attached and the baby struck Watson as "stolid and unemotional". The best example of volunteer sampling is Milgram's 1963 obedience study. Milgram advertised for volunteers in the local newspaper, offering $4 for men who would take part in a memory experiment. The target population was men from New Haven, Connecticut, aged 20-50, but excluding students. Presumably, Milgram felt that students might figure out the true nature of the study, introducing demand characteristics. The sample would have included willing and enthusiastic volunteers, but perhaps not representative ones. After all, you must be a fairly unusual "factory worker" or "barber" who wants to give up an hour of his time to take part in a "study of memory and learning". Burger (2009) replicated Milgram's volunteer sample, but went to much greater lengths to screen out anyone with emotional problems or who knew about Psychology. Random sampling is very rare in psychological research and none of the Unit 1 studies on this site make use of it. So if an Exam asks you what sampling technique a study uses and you're tempted to write "random sampling", think again..! There are no clear examples of stratified sampling in the Unit 1 Specification. Bandura's Bobo Doll studies make a point of using a 50-50 split of boys and girls, which is an example of stratas, but the sample isn't populated randomly. Bandura uses the Nursery School at his university, so this is a cluster sample. Baddeley (1966b) recruits his sample from the university "subject panel". This is a group of people who have signed up with the university to take part in any sort of social science research. Using a sample group that another organisation has constructed is cluster sampling, but universities who maintain (or often share) a subject panel take some trouble to make sure it is stratified with different ages, genders, ethnicities and backgrounds. A 8-mark “evaluate” question awards 4 marks for describing opportunity sampling (AO1) and 4 marks for evaluating it (AO3). You need a conclusion to get a mark in the top band (7-8 marks). "Opportunity sampling" turns up in the Specification for the Social Approach but you need to know how all types of sampling are used in all the Approaches. Opportunity sampling involves selecting a sample on the basis of who is available at that time and place. The findings from the sample are then generalised to the target population. An example of opportunity sampling is Sherif's Robbers CAve study. Sherif selected boys who were observed to be athletic and confident in the school playground. Another example is Watson & Rayner's Little Albert study. Little Albert was selected because his mother worked at the same hospital as Watson. The strength of opportunity sampling is that it is quick and convenient and this saves time and money. Opportunity sampling may remove some bias because the researcher can "screen out" inappropriate people. For example, Sherif would not let school principals recommend their favourite students. However, it adds researcher bias because researchers might choose participants who are similar to them. If the sample group reflects the researcher's bias, it will not be representative of the target population. Opportunity sampling is popular because it is so convenient and it's suitable if the target population meets in a location where the researcher can access them. However, the selection will always have some bias to it. Notice that for a 8-mark answer you don’t have to include everything about opportunity sampling. I haven’t mentioned Sherif's biases or Watson's reasons for choosing Albert. But it is a balanced answer - half description, half evaluation.